The ‘Square Mile’ has seen its fair share of fires since a settlement was first founded here by the Romans 2,000 years ago. But two big events dominate in the history books – the Great Fire of 1666, which left four-fifths of the City in ruins, and incendiary bombs dropped during the Blitz created a firestorm which brought considerable damage to buildings and killed thousands. For the Londoners that lived through these devastating attacks, you can only imagine the trauma they faced as people lost their homes and everything they had worked for. 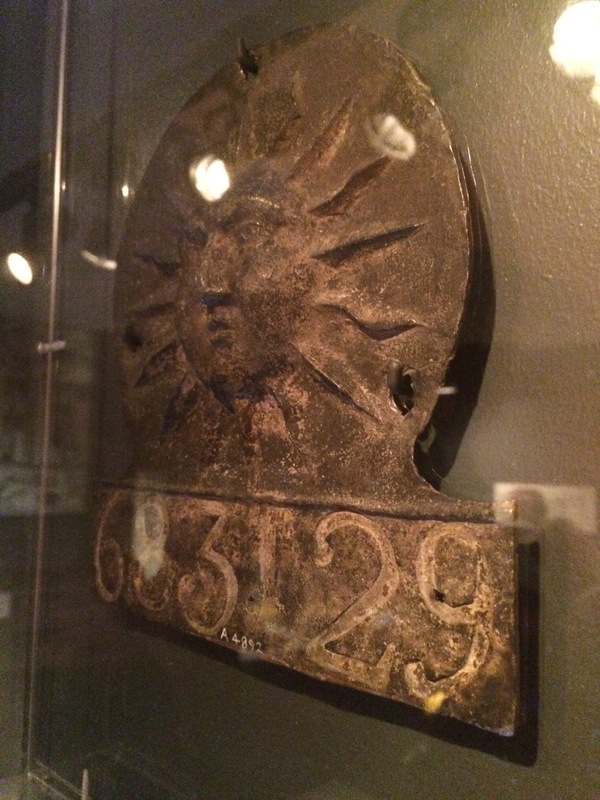 The more result event also of course brought with it considerable human casualties (remarkably the 1666 blaze is said to have only killed about 10 people, but some 100,000 were left homeless and destitute). But while the circumstances and causes of both attacks on the capital were very different, it’s interesting to consider them together. Both fires wiped out considerable swathes of the Square Mile, prompting ambitious individuals – perhaps wanting to make names for themselves – to come up with eye-catching plans for building London afresh. Had the plans been realised then London, the great city that has emerged through history would be unrecognisable today. In the end, however, after both attacks planners opted to construct new buildings on largely the same street pattern, giving the capital a considerable USP over other cities in the world that are so modern that they have lost sense of their heritage. 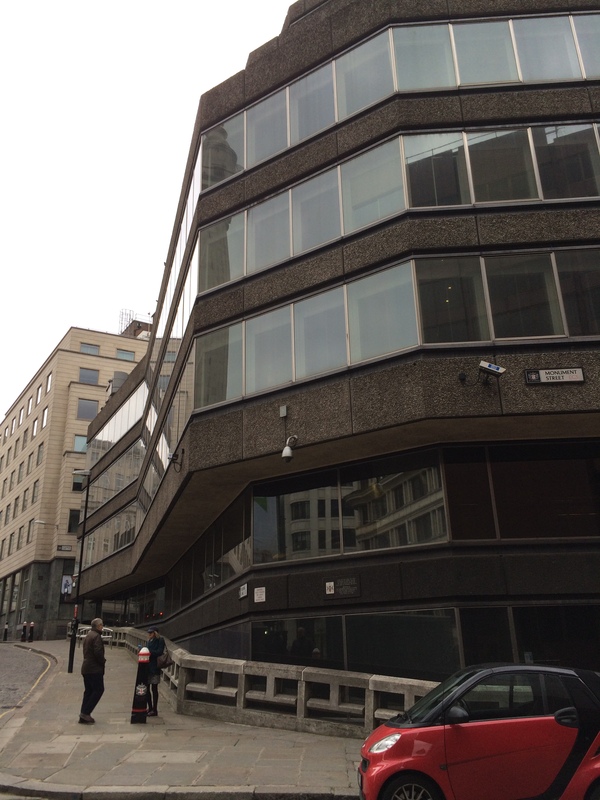 I went on a fascinating guided walk, run by the City of London Guides, to get a greater understanding of how these parallel events affected the city’s landscape. Starting opposite St Paul’s cathedral, Peter – our guide – showed us a plan etched into the ground which compared the current church to the much larger medieval building that was destroyed by the Fire of London. The building at the time was being repaired and was surrounded by wooden scaffolding, making it perfectly combustible. Christopher Wren’s new cathedral was built between 1675 and 1714 using a cathedral amount of rubble from the old one and included a fine dome, which replaced a tower. Three centuries later, although the Blitz caused some damage it largely remained intact. Today, perhaps one of the most interesting features is a triangular pediment on the south side with a mythical bird called a phoenix, with an inscription in Latin that translates to: “I shall rise again”. This is appropriate given that the cathedral – and the wider city – recovered from both blazes. London in 1666 was tightly-packed city of timber houses, with upper overhanging sections meaning that properties pretty much touched each other across the narrow streets. This, combined with the fact it had been a dry summer and there was a strong eastern wind, meant that the blaze spread easily. Pudding Lane was also near warehouses which were full of oil and other combustible materials. As the blaze ripped through the City, Bludworth was advised to approve houses being pulled down to stop it spreading, but he refused, probably realising that he would need to pay compensation to their owners. Only on the third day of the fire (it lasted for four days in total) were properties cleared to stop it spreading. And while London did have fire engines (one from the time is on display at the Museum of London), it didn’t have fire brigades in the formal sense. 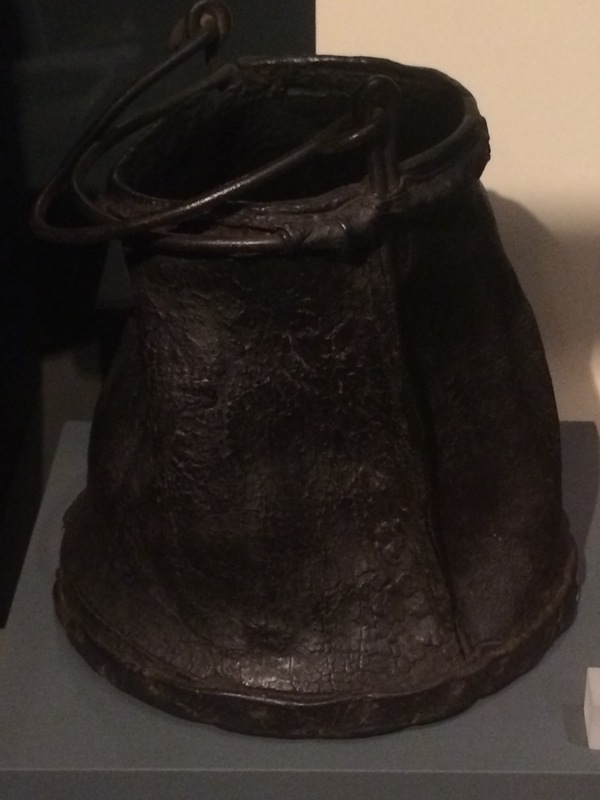 Local, ill-equipped people were expected to club together with others in there parish and used buckets and metal-squirts (both on display at the same exhibition, with a collection of charred bricks from basements, fire helmets and examples of over-hanging signs that protruded from buildings in narrow streets) . The fire burned for four days, wiping out 13,200 homes, 87 churches, St Paul’s cathedral, four stone bridges, plus all the commercial and municipal buildings. The destruction stretched from around Fetter Lane (just short of Temple) in the west to almost the Tower of London in the east). And in monetary terms, it is estimated the blaze cost London around £10 million (including about £2 million worth of printed books and stationery). England was at war with Catholic France and Netherlands at the time and some said the fire was an attempt to destroy the Protestant city of London (Robert Hubert, a Frenchman suffering from mental problems, actually confessed to the crime and was hung in October 1666. It only later emerged that his ship hadn’t arrived in London until after the fire began). Others blamed it on the sins of Londoners (not least gluttony, since the fire had started in Pudding Lane). In reality the fire was caused by an accident, with Farriner having failed to properly extinguish his oven before going to bed. As thousands lay homeless in makeshift camps on the edge of the city and others slept in tents on the plots were their homes had stood, plans quickly emerged proposing a complete re-building of the Square Mile. John Evelyn was one of the architects who suggested that London should create a new city, with fine squares and boulevards, to match that of existing cities in continental Europe. The City would have lost the hotchpotch of narrow winding streets in favour of something that was much more orderly (one proposal even suggested building a canal running through the middle). But in the end none of the grand plans were implemented (landlords would have needed to be compensated and there was a pressure to start re-building as soon as possible). On the guided tour we did however walk along the one new street that was created (King Street, which runs from the Guildhall, and later continues as Queen Street down to the Thames). Other roads were widened and sanitation was improved. And there were of course also many new fine public buildings constructed, including the Royal Exchange, and the Guildhall was repaired. 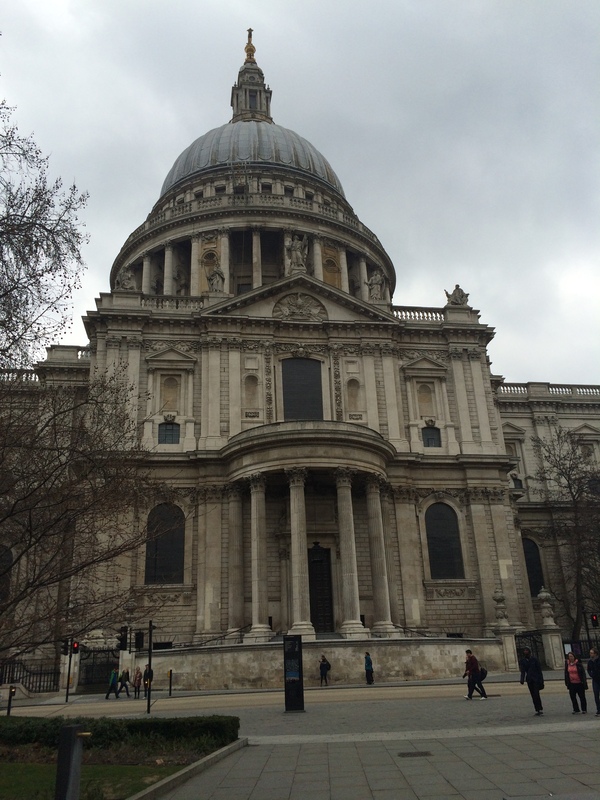 Christopher Wren led a team that re-built 52 churches (39 of which survive today) and of course St Paul’s cathedral. Public buildings were paid for from a coal tax. 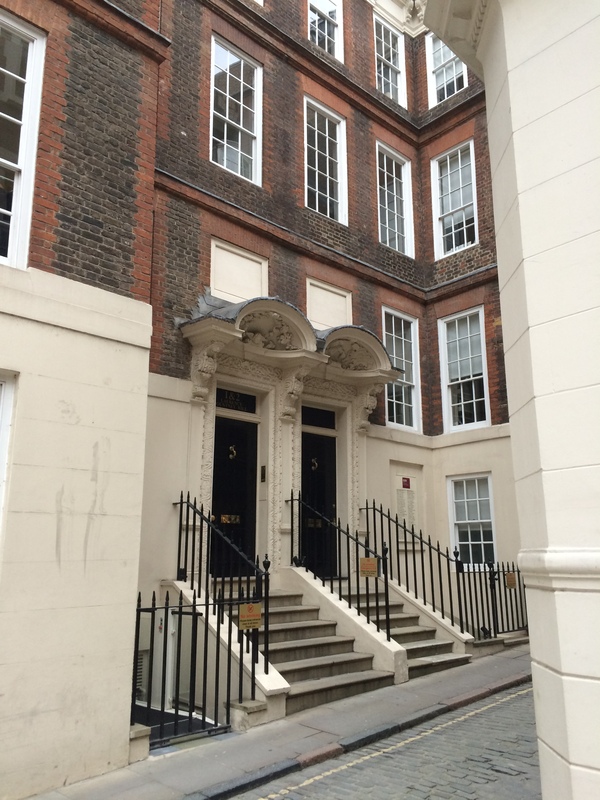 On the walk, Peter showed us some brick-built houses – flat-fronted and without any protruding sections – in a quiet alleyway off Canon Street which were among some of the first properties to be constructed after the 1666 blaze. The first house dated from 1703 and is now a barrister’s offices. The next one we saw is actually a private home and has a lovely garden. There was no home insurance in 1666, but in the years that followed such companies were formed and for an annual fee, they would pay for a house to re-built if it burned down. 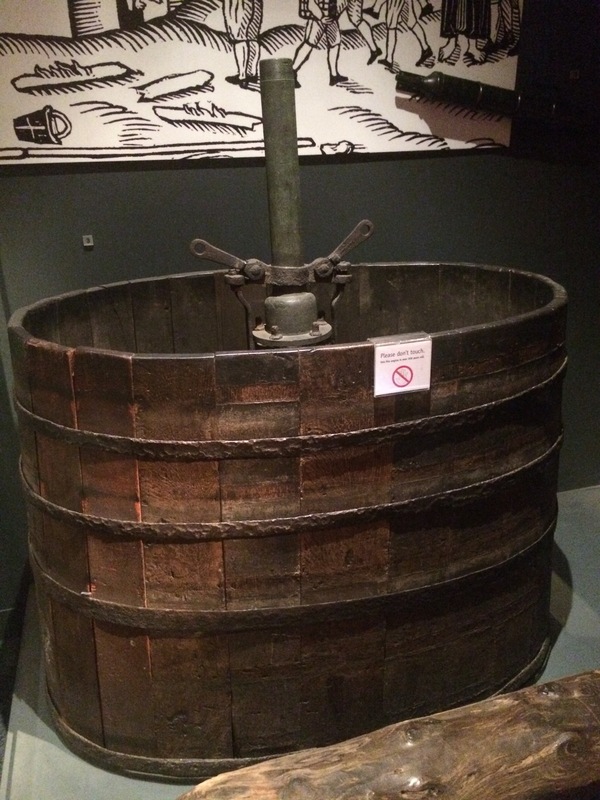 The Museum of London showcases many of the firms’ crescents. By 1700s the insurers even had their own fire engines (an official London fire brigade was formed in 1865). It is said that by around 1670 a major rebuilding programmes had been completed and life was returning to some degree of normality. But it did signal a significant shift in the development of the City because in the years that followed many opted to move from the Square Mile to newly built squares in the west. London was on the move. Almost 300 years after the Great Fire of London destroyed the fabric of the capital, the City was again under attack. The Blitz during the Second World War brought firestorms through the Square Mile (and elsewhere) from a sustained bombing campaign that began in September 1940 and ended in spring 1941. 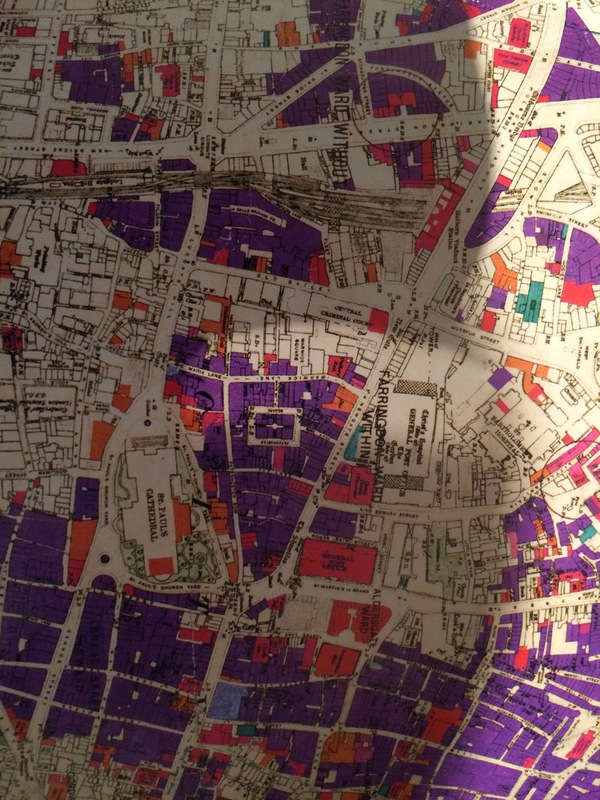 If you look at a map published by the London County Council you can see just how devastating the Blitz was, with the purple colour highlighting damage beyond repair and yellow minor damage. 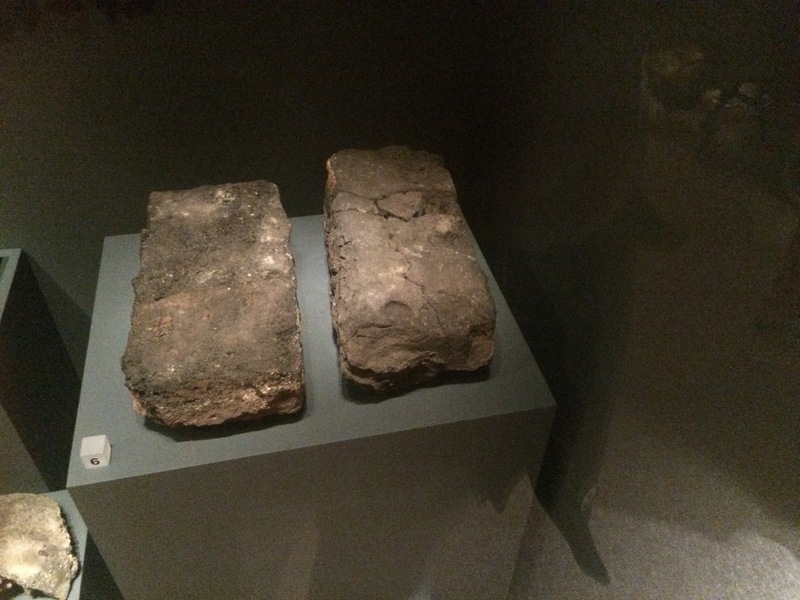 The attacks wiped out many fine buildings that had been constructed following the 1666 fire. On my guided walk, I saw how the traces of the Blitz can still be seen today, not least in the bombed-churches which have remained as just shells. In three instances, only the stone towers survived, standing on their own without a church building attached to them. We visited, for example, the ruin of Christ Church Newgate. Re-built by Wren following the 1666 fire, it was then severely damaged on 29th December 1940 when a firebomb hit the roof and tore into the nave, wiping out much of the surrounding area. It was decided not to build it again at the end of the Second World War, but in later years a beautiful garden was created against its shell. “It’s a real country garden,” said our guide Peter. The stone tower remains standing and is a private residence (complete with lift). As in the aftermath of the 1666 fire, there were radical plans for London following the Blitz. Patrick Abercrombie, who was professor of town planning at University College, produced two bold blueprints (in 1943 and 1944) which would have brought a complete re-building of a London that favoured the motor cars. At the heart of the plans was “a rearrangement of population and industry… The numbers in the centre will decrease, those in the outer areas will grow.” Ten new satellite towns would have been built, while the growth of the suburbs would be curtailed by legislation preserving the green-belt. And some districts would have been built more of less completely. Abercrombie’s plan was never of course completely followed, but councils did clear slums in what was he had termed “comprehensive re-development” and build tower blocks which are today being knocked down. Yet in the City, the plan wasn’t as drastic as he had intended, but an ongoing construction modernisation programme was launched that continues to this day. The Blitz by its very nature brought attacks from many directions, but much more of the city’s fabric remained intact compared to the aftermath of the 1666 fire. We have seen building regulations imposed post-1666 outlawed the use of timber and structures weren’t as close together. There was also a professional fire brigade in place by the Blitz. 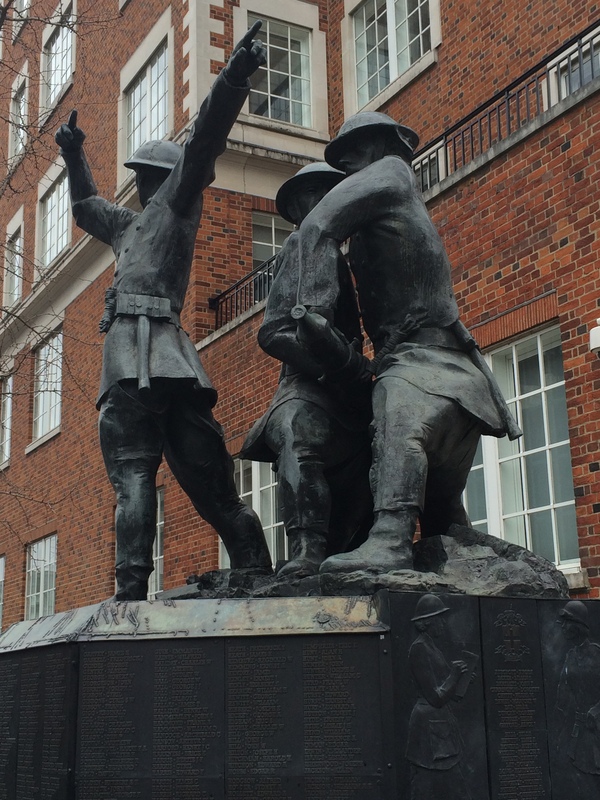 Opposite St Paul’s Cathedral, there is a monument to the firefighters who died in the Second World War with some one thousand names listed on the plinth (it was initially just for London, but then decided it would remember those from across the country). “These brave men were out on the streets as soon as the bombs came down,” said Peter. “And quite a lot of them were killed.” By stopping the fire spreading, these were the real heroes of the Blitz. 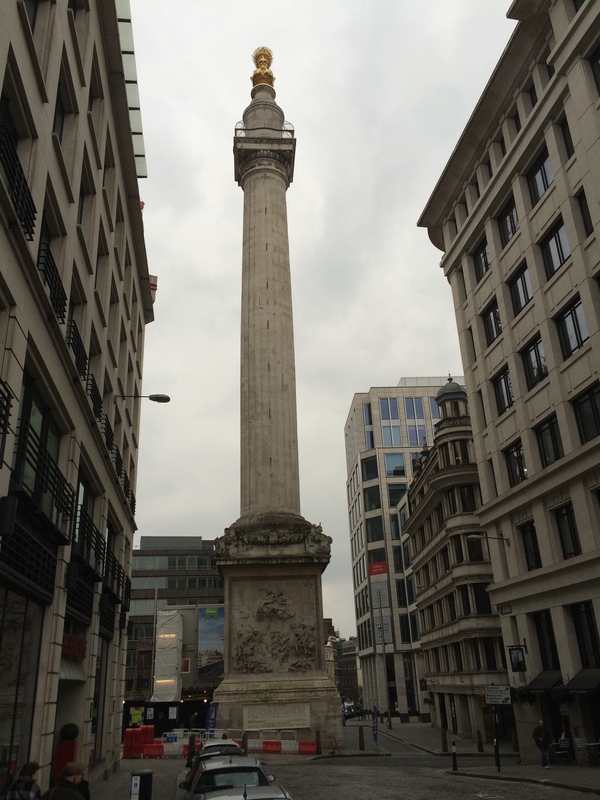 Today, the Great Fire of London is remembered by the Monument, where we ended our walk. Erected in 1677, it is a powerful reminder that London rose from the ashes fighting after such a devastating attack. Fittingly, the tower (which has a fine viewing platform that can be reached today) is 61 metres – the exact distance between it and the site in Pudding Lane where the fire began. 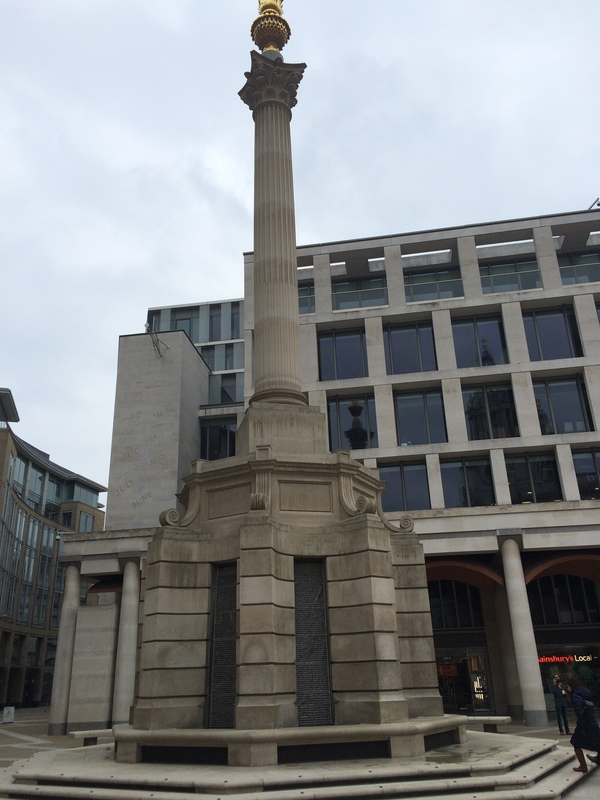 But what many may often miss is that there is a smaller-scale monument (officially known as the Paternoster Column), dating from 2003, in Paternoster Square that remembers the defiance shown following the Blitz. Created out of Portland stone, with Cornish granite and gilded copper, the 23 metre structure is actually a ventilation system for the car park below. Two fires almost 300 years apart may on the face of it have little connection, yet take a closer look and you realise that the situations are actually quite similar. London, on both occasions, rose again like a Phoenix from the ashes, yet during the re-building it has never lost its sense of its history. Paternoster Column remembers the defiance shown in the Blitz.